As soon as I removed the new Barnes & Noble Nook from its box, I could tell that this petite e-reader was going to be a worthy challenger to the third-generation Amazon Kindle. Impressively, when I tested the Nook and its new touchscreen, I found that it does indeed out-Kindle the Kindle at its own game in some respects; but in others, the Nook falls shy of topping Amazon's e-reading staple. 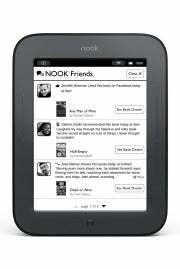 The new Nook Simple Touch ($99 as of 11/22/2011) has been completely redesigned, yet retains the same moniker as the original Nook, which is now referred to as Nook First Edition. That year-and-a-half-old Nook missed the mark with a clunky LCD screen for navigating the E-Ink display above it. This new Nook is lighter, more svelte, and introduces Neonode's Zeforce infrared touch technology to simplify access and navigation, as well as a Wi-Fi connection. Where the Nook First Edition's weight and size made it bulky, unwieldly, and generally unpleasant to use, the new Nook is the polar opposite: It weighs 0.47 pounds--35 percent lighter than the original Nook, and slightly lighter than the third-generation Kindle Keyboard (0.60 pounds), and slightly heavier than the fourth-generation $79 Kindle With Special Offers (0.37 pounds). It's also more compact--6 percent thinner and more than an inch shorter the first Nook. It now measures 6.5 by 5.0 by 0.47 inches--notably smaller than its older sibling. That makes it half-an-inch wider than the fourth-gen Kindle. In hand, the difference between the two versions is palpable. The new Nook is clearly made for curling up with and holding in one hand for an hours-long dive into another universe; that's exactly what I did with it on its maiden voyage. Its size and weight do make it easier to hold than the First Edition, and it's even slightly easier to hold than the current Amazon Kindle, which integrates a physical keyboard and has no touchscreen display. It's remarkably well-balanced to hold, be it in one hand or two; I found it quite comfortable to hold with my thumbs along the bottom bezel, and my index fingers and forefingers bracing the back. The physical shape of Nook is pleasing in-hand, too: The e-reader's front and back both have a textured rubber finish, much like you'll find on a cell phone. The backplate cover dips in; those millimeters effectively give the Nook a built-in grip to make it even easier to hold. Nice touch. Now that the Nook has a touchscreen, most navigation will be done on the display, not via the buttons. As on the Nook Color/Reader's Tablet, the main home button is a lowercase "n" beneath the screen. Here, the "n" starts the display's wake-up process (as with cell phones, you also have to slide your finger along the screen to wake it fully), and returns you to the quick navigation buttons on-screen. These buttons are similar to the ones that were the central navigation mode on Nook First Edition, but they've been refreshed and updated to reflect the new Nook's interface, and bring it in line with the Nook Color/Reader's Tablet. Gone are options like "the daily" and "reading now"--both of these options have been combined under the "home" screen, which shows what you're reading now, what's new in your library (be they new purchases or newly delivered subscriptions), and, at bottom, what to read next based on B&N's recommendation engine. My biggest gripe with the Nook's design happens to be with its physical navigation buttons. The easy-to-depress, outward-facing buttons on Nook First Edition have been replaced by cheap-feeling, raised rubber strips that run along the left and right bezel. The buttons are stiff and require a very precise and deep press to activate; and even though your finger can bleed a bit towards the edge of the e-reader and still manage to activate the button action, ultimately the experience is nothing like the buttons on Nook First Edition and on Kindle, which are both easier to depress and can work with your whole finger, not just your fingertip. If you're wedded to the use of buttons for changing pages, I'd actually steer you away from this Nook--that's how poorly implemented I consider these buttons. And that's a disappointment, since the new Nook gets so much else right. The significant remaining addition to the Nook is its new E-Ink Pearl display. E-Ink Pearl brings Nook up to speed with the other monochrome e-readers on the market today. The new Nook uses the same 6-inch, 800-by-600-pixel Pearl display that Amazon and Sony integrated in their e-readers last summer and fall, respectively, and the same display as in Kobo's eReader Touch Edition. The Pearl display is known for providing better contrast than earlier-generation E-Ink displays, but oddly, in my hands-on tests with the three e-readers side-by-side, I observed different results. As it originally shipped, I found that the new Nook's display provided only nominally better contrast than the one on Nook First Edition, and that the Amazon Kindle actually has the best contrast of the three, with blacker blacks, and a brighter gray background than on the new Nook. I had the three e-readers set to similar text passages, with closely matching if not identical fonts (at the least, I observed behavior with all e-readers set to nonserif fonts, and to serif fonts). However, the Kindle and the new Nook flipped places on the home-screen display: There, the Nook looked better than the Kindle. I chalk this up to the vagaries of the different fonts and text sizes, and to the fact that these differences cause the blacks to appear different on the different devices. They're close, but by no means identical, in spite of using the same display technology. In November 2011, Nook Simple Touch got a firmware update that greatlly improved the contrast of the text and graphics. Blacks made are darker than before, which makes text easier to read and graphics jump off the screen. I'd put the Nook's text quality now as the best I've seen among E Ink e-readers. And the viewing options are more flexible than Amazon's Kindle or Kindle Touch; Nook has six fonts and eight font sizes to choose from. The update also improved on B&N's already speedy page refresh rates and page turns. The e-reader still does a full refresh once every sixth page, but by doing what manifest as fast dissolves between pages, B&N lets you effectively rapidly page ahead dozens of pages, while mitigating the annoying page-flashing effect long associated with E Ink. B&N does targeted refreshes on a page that has just graphics changing (for example, in the e-reader's bookstore), and on areas that will have a heavy redraw. Though touch makes the Nook easy to navigate, occasionally where you can swipe and where you can't isn't always clear. For example, you can swipe through some modules in the bookstore, down on some pages, but not on others. For the most part, this is stuff you'll learn through trial and error, and doing so is not hard. You can turn pages by tapping on either the left or right side of the screen; or you can swipe left to right (and, on some screens, even vertically) to change pages, too. While reading, tap at the top of the screen to reveal a status bar--the bar will show battery status, a clock, and a tap-to-add bookmark; it will also reveal the same book navigation buttons you'd get if you tap in the center of the page. The buttons jump you to the table of contents, let you search for a word or passage within a book, go to a specific page within a book using a slider (and kudos to B&N for including here just how many pages are left in the chapter), or adjust text options (choose from six not-so-different fonts and seven very different font sizes). The "more" option was confusing, though: I'm already in the book, and reading it, so why would I want to go to the book's profile from the Shop, showing editorial content, reviews, and related titles? I get the share and LendMe options as being appropriate while reading, but the rest of this menu option left me puzzled. Beyond that one interface annoyance, though, I was largely impressed by the B&N's otherwise clean, logical software design. B&N clearly gave some thought to the layout, and to how things operate. The interface is good, at times even great--but not perfect. An example is how B&N has implemented its notes and highlights features. Really, these are the most usable examples of such features that I've seen on an e-reader to date. Tap and hold your finger on a word to select it; then you can either drag the pins to select a passage, or choose an action such as adding a note or looking up the word in the Merriam-Webster Collegiate Dictionary. Unfortunately, I had trouble grabbing quotation marks to complete a passage; also, right now you can't view all notes, highlights, or a combination of the two. Instead, you just see a teaser of the passage under a tab for Notes and Highlights in the table of contents. B&N says it expects to offer some way to view and share notes and highlights when it launches the My Nook portal, but that portal isn't ready as of this update. For now, you can view and share highlighted quotes with Gmail contacts, via Facebook or Twitter. You can also share information about books you're reading, to make a recommendation, post your reading status, rate and review a book, or like it on Facebook. Nook has the same Nook Friends capabilities as on Nook Color; this social platform moves reading away from being a solitary exercise, but it does so in a less intrusive, less all-about-me way than on competitor Kobo's social platform. And it makes these functions far easier than on Amazon's Kindle. The bookstore portal has also been redesigned, and its new interface, coupled with the touchscreen, does make shopping far simpler than before. The Nook has 2GB of built-in storage, and a microSDHC card slot hidden beneath a secure flap door on the side for additional storage. In addition to sideloading ePub and PDF files, Nook reads JPEG, GIF, PNG, and BMP image files. Unlike many other e-readers, Nook reflows the PDF text, which makes it great for reading text, but a mixed bag if you're trying to read a document that's heavy on its particular layout. The e-reader runs Android 2.1, which makes changes and tweaks via firmware update viable. Sadly, as of now B&N says it has no plans for opening up its E Ink Nook to apps. The device also has no Web browser, and no on-board e-mail, disappointing omissions given how central these can be to reading. Battery life should be up notably: Barnes & Noble says that the Nook can last up to 2 months on a single charge, with the Wi-Fi turned off. We'll have to check in later with an update on how its battery life does in the real world. At $99, the Nook SimpleTouch is competitively priced, and a bargain compared with other touchscreen E Ink e-readers, which only achieve this price by adding advertisements to the home screen and lock screen. Nook wins favor for its interface and touch navigation. Those factors, coupled with its light weight and long battery life rating, make Nook a solid choice, as long as you plan to use the touchscreen and not the buttons to page through your books.